There are 20 cases in the book that can be called strategic. The Head of Information Center for Human Rights Tacciana Piaczonczyk says that the cases raise the question of systemic violations of human rights, caused by gaps in legislation and problems of court practice. “The aim of the title is to distribute the information about strategic court cases as one of the most efficient instrument of defense of human rights”, she adds. The dramatic confirmation of this is the case “Verencou agains the Ukraine” that was won at the European Court of Human Rights. The case regards the prohibition of peaceful assembly. The claimant in that case was a citizen of Lvou who tried to draw attention of the society to the problem of corruption at procuracy authorities. That’s why he decided to hold meetings near the building of procuracy. The meetings should have taken place during half a year starting from August 2011. The quantity of potential participants had to be no more that 50 people. All this was brought to attention of the Lvou city authorities. The patience of the law enforcement authorities run out on the 12th of October, when Vierencou and two dozens of activists organized another action. Police officers declared that the demonstrants have no rights to approach the building of procuracy no closer than 5 meters. That’s why the activists had to go to the other side of the street. Police officers announced that it was illegal too and tried to forbid Vierencou to hold a meeting. However he decided to continue to protest. 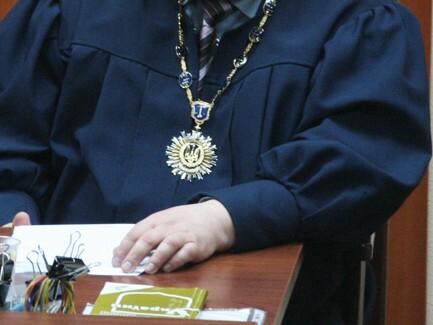 On the following day Lvou regional administrative court prohibited Vierencou to hold the meetings on the claim of local council. Aliaksiej Vierencou was also accused of conduction of administrative offense, of willful disobedience to the authorities and violation of the order of demonstrations. He was detained for trial and Halicki regional court of Lvou found him guilty of commission of the offense and sentenced him to 3 days of arrest. After being released Vierencou appealed this court judgment. However Lvou Regional court of Appeal dismissed the complaint. Then he appealed to the European Court of Human Rights, that found in favor of him and recognized that disturbance of his freedom of peaceful assembly was illegal and unrequired in democratic society. The ECHR also draw attention that Vierencou case “revealed the gap in the Ukrainian legislation regarding freedom of peaceful assembly, that had existed for two decades”. That’s why the state has to reform the legislation by providing requirements to organization of peaceful assembly and grounds for limiting. There are lots of such cases, won by the Ukrainians in the ECHR. There are over 50 of such cases on the account of only Kharkiv Human Rights Protection Group. There are much more cases, that not only contribute to restoration of justice, but to changing of court practice in the Ukraine regarding questions of vital importance, human rights defenders and attorneys won at domestic courts. Dispute of attorney from Dnieprapiatrousk Zmicier Zhary, who was unable to reach a pharmacy in his home town in a wheelchair is a perfect example. For a long time he asked the administration of the pharmacy to equip the room with a wheelchair ramp. But he wasn’t heard. After ineffective correspondence with officers of State inspection for quality control of medicinal products of Dnieprariatrousk region and Head planning authority he initiated a lawsuit in Country administrative court of Dnieprariatrousk. Zmicier Zhary wanted to change the situation with organization of free access to drug pharmacies for disabled people in the whole country. However only appeal court accepted his claims and recognized inactivity of State inspection for quality control of medicinal products of Dnieprariatrousk region in the sphere of verification of the fulfillment of licensing requirements to be illegal. Moreover, the appeal court obligated to consider cancellation of license for retail drugs of the pharmacy to which the claim had been put forward. After that prime minister Mikalaj Azarau directed the Ministry of Health together with the Ministry of Regional Development to develop the changes to Licensing terms of pharmacies and health facilities, that will guarantee free access to the premises for disabled people. That’s how efforts of one person to defend his rights could affect the situation in the whole country. Afterwards other people started following the example of fighter against discrimination from Dnieprapiatrousk. So, a young woman from Danieck Tacciana Hraczysznikava, who has to move in a wheelchair after a car crash, won a lawsuit against a night club. The workers of the club didn’t allowed her and her friends in the club and spoiled her holiday and mood by their provocative behavior. Blind attorney from Lvou won a lawsuit either. He asked “Ukrzaliznytsia” to adapt the website of transport monopolist to the needs of blind people. These cases also on the list of cases that are changing the Ukraine. The first case f the book is the case against Czarnihau regional council that was won by parents of minor children. This case is about appealing of the curfew decree that was taken by the officials. According to this decree children younger than 14 years old could not legally stay in the street or other public places unattended by adults after 22 p.m. For children aged from 14 to 16 the time of proscription started from 23 p.m. In the opinion of human rights defender Uladzimier Javorski, such decree violates the right of the citizens to movement. - The practice of curfew exists in totalitarian countries – in Russia and in Belarus, which domesticated it fro the USSR, – explains he. – The Ukrainian authorities decided to domesticate such a non-democratic method either in 2009. That’s why after Czarnihau regional council brought in the curfew decree, the came decrees were passed by in 2/3 of the Ukrainian regions. These decrees are illegal because they contradict to basic constitutional principles. On their basis social services together with law enforcements began to take a lot of parents to court for failure to comply with the parental responsibilities. And most of these charges were unjustified. Because there were cases when children were on their way home after sports training. That’s why parents decided to appeal the curfew decree of regional council with the help of human rights defenders and won the lawsuit. We hope that in future the activity of the Ukrainian citizens will not decrease. The Ukrainians should understand that the win of the lawsuit can not only change the court practice, but can help to achieve fundamental changes in the state system. - There is a belief that a person can not change the history on his own. He has to join the parties, professional unions, non-governmental organizations, has to gain political influence, and only then he can think of changing something for the better. Sometimes it is so, but in most cases it isn’t. A brilliant creation of mankind – a lawsuit – gives a person a possibility to stand against not only invasion of strong and powerful, but the whole systems. And not only to stand against, but to change these systems. To change courts in order to give others possibilities to use these changes for defending their rights. A win of a lawsuit becomes an impulse for sufficient reforms in state system and politics. A case of Ermesta Miranda who was never an authoritative person, made Supreme Judicial Court of the US to reform criminal justice and spend billiards of dollars on creation and functioning of free legal assistance. Without this prosecution risked of loosing the case. On the claim of Defense fund of environment and consumers against authorities the Court of Deli mentioned that the right to free education can not be allowed until the state provides schools with primary infrastructure. That made Indian authorities to spend money on sanitary equipment for schools. There are lots of other examples of how unknown until then quarrelers influenced on forming and reforming of the whole systems. Some of these cases are very famous and are quoted in many documents, some are unknown out of certain city or region. But in any case they are undisputed contribution to what we call legal culture. The cases, importance of which is not limited by the private interest of the party, but influences on the development of the legal system, we call strategic cases or cases of public interest defense. They influenced on the situation with human rights one way or another. Some of them led to the reforming of the legislation, others on the contrary prevented practice of violation of legislation or international agreements. Some of them took shape of certain reforms, others are only to be embodied. In any case due to such cases words “justice”, “law”, “court” will not become only a name. Editorial note: descriptions of strategic cases that was won by the Ukraine at ECHR together with relevant documentation, and also PRACTICAL SUGGESTIONS ON APPEALING TO EUROPEAN COURT OF HUMAN RIGHTS AND OTHER INTERNATIONAL ORGANIZATIONS can be found on human rights website STRATEGIC LITIGATION PLATFORM.